Folks from all over the world are reporting a wide variety of different issues with their Windows 10 computers following the release of the Windows 10 Creators Update. As is the case with most Windows updates, the aftermath of the release of the Creators Update hasn’t been pleasant from Microsoft as they have been bombarded with negative feedback and reports of problems, issues and bugs. It seems that one of the most prevalent issues affecting Windows 10 computers that the Creators Update has been installed on is spontaneous crashes and rebooting. A significant amount of Windows 10 users who have installed the Creators Update on their computers are reporting their computers crashing at completely odd times and rebooting. Reports suggest that computers affected by this problem can crash and reboot even when its hardware is not being particularly stressed and CPU temperatures, GPU temperatures and all other attributes are completely optimal. Checking the Windows Event Logs on computers affected by this issue isn’t any help as the only events recorded in the logs state that the previous system shutdown was unexpected. Note: The crashing issue after the Fall Creators Update (1709) is addressed in the end. Download and run Reimage Plus to scan and restore corrupt and missing files from here, once done proceed with the solutions below. It is important to ensure that all system files are intact and not corrupt before proceeding with the solutions below. 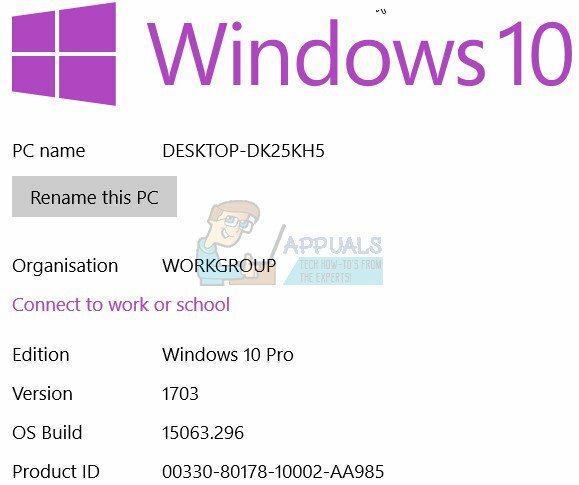 Some third-party applications – such as Speccy, Acronis True Image, the Office Hub App and most third-party security programs (antivirus, antimalware and firewall applications) – can clash with Windows 10 post-Creators Update, leading to the user experiencing this problem. If such a third-party program is the cause of this issue in your case, simply uninstall any problematic third-party programs installed on your computer, and your computer should no longer be suffering from this issue. If you would like to uninstall a third-party security program installed on your Windows 10 computer but don’t know how to do so, simply use this guide. Press the Windows Logo key + X to open the WinX Menu, and click on Powershell (Admin) to launch an elevated Powershell that has administrative privileges. Alternately, the same result can be achieved by opening the Start Menu, searching for “cmd”, right-clicking on the search result titled cmd and clicking on Run as administrator. Wait for the command to be successfully executed. Close the elevated Command Prompt. Restart your computer. When the computer boots up, continue using it and check to see whether or not the issue has been resolved. Once the Creators Update has been installed on a Windows 10 computer, issues such as this one can come to life if the computer in question has outdated chipset drivers or outdated BIOS firmware. To make sure that’s not the case, make your way to the Downloads section of the official website of your computer’s manufacturer (or the manufacturer or your computer’s motherboard) and check to see whether or not the chipset drivers and BIOS firmware installed on your computer are the latest versions. If you find that a newer version of the BIOS firmware for your computer or any of your computer’s chipset drivers is available, immediately download and install it as an outdated one could’ve been the cause of your sorrows. Outdated network adapter drivers can also turn out to be the cause of this problem in many cases. To make sure that the drivers for your computer’s network adapter are up to date, first you need to press the Windows Logo key + X to open the WinX Menu, click on Device Manager, double-click on the Network adapters section to expand it, determine which one is your computer’s active network adapter and note the name of its manufacturer. Once that’s done, simply navigate to the Downloads section of the official website of the manufacturer of your computer’s network adapter and check for the newest version of the drivers available for your specific network adapter. If it turns out that you have an older version of the drivers, simply download and install the latest version of the network adapter’s drivers and that should get the job done. Click on the search result titled Power Options. 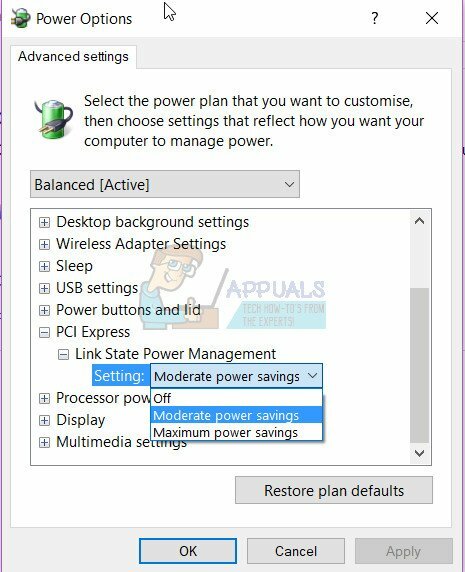 Click on Change plan settings in front of the power plan your computer is currently using. Scroll down, locate the PCI Express section and double-click on it to expand it. 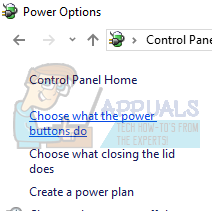 Double-click on the Link State Power Management sub-section to expand it and reveal its Setting. Open the dropdown menu in front of Setting and click on Off to select it. Click on Apply and then on OK, close the Power Options window and restart your computer. Check to see whether or not the issue has been fixed as soon as the computer boots up. Click on Privacy in the left pane. In the right pane, locate the Location toggle and slide it to Off. Restart the computer. When the computer boots up, you may check to see whether or not the issue still persists and whether or not the fix actually worked. Press the Windows Logo key + X to open the WinX Menu. Double-click on the Display adapters section to expand it. Right-click on your computer’s graphics card and click on Disable in the context menu. In the resulting popup, click on Yes to confirm the action. 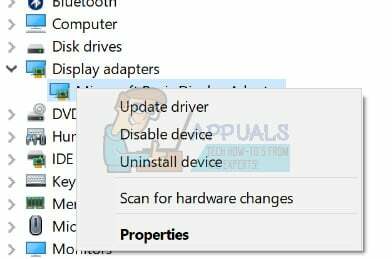 Once your computer’s GPU has been disabled, wait for a couple of minutes, and then repeat steps 1–4, but this time you are going to click on Enable instead of Disable. Close the Device Manager and restart your computer. Wait for the computer to boot up and check to see whether or not this solution did the trick. While you’re at it, you should also go to the Downloads section of the official website of the manufacturer of your computer’s graphics card and make sure that you have the latest version of the drivers for your specific GPU and OS installed. If there is a newer version of drivers available for your GPU/OS combination, the outdated version being installed on your computer could be the culprit behind this problem, so be sure to download and install the latest version of the drivers. Go to the Downloads section of NVIDIA’s official website with an internet browser of your choice. Put in the details of your NVIDIA GPU, your Operating System and your preferred language, and click on Search. See if a version 382.05 of the drivers for your specific NVIDIA graphics card and Operating System combo are available. If version 382.05 is available, download the installation package for it. Wait for the installation package for version 382.05 of your NVIDIA GPU’s drivers to be downloaded. Once the installation package has been downloaded, navigate to where it was downloaded, locate it and run it. Go through the installation process until the very end to successfully install version 382.05 of the drivers for your NVIDIA GPU. Once the drivers have been installed, simply restart your computer and check to see whether or not the problem has been fixed once it boots up. Click here to be taken to the official Download page for GeForce Hotfix driver 381.78 on your default internet browser. From the Download page, download either the 32-bit or the 64-bit version of GeForce Hotfix driver 381.78 (depending on the version of the Windows 10 Operating System that’s installed on your computer). Once the installation package for GeForce Hotfix driver 381.78 has been downloaded, navigate to where it’s been downloaded, locate it and run it. Go through the installation process and install GeForce Hotfix driver 381.78. Once GeForce Hotfix driver 381.78 has been successfully installed on your computer, restart Check to see whether or not the Hotfix driver resolved the problem once your computer boots up. AMD Cool’n’Quiet is a CPU dynamic frequency scaling and power saving technology designed by AMD and introduced by the company with its Ahtlon 64 line of processors. The technology basically reduces the processor’s clock rate and voltage when it is idle to save power. The Fast Boot option that comes with most Windows computers that have UEFI motherboards does exactly what its name suggests – it allows computers to boot up faster than they normally would. 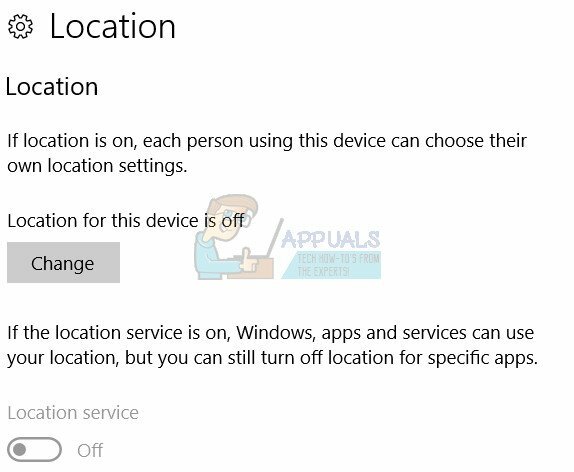 Both of these options which can be enabled and disabled in a Windows 10 computer’s BIOS have been identified as the cause of this issue in many cases. At the very first screen you see during startup, press the key that will get you into your computer’s BIOS settings (this key varies from one computer manufacturer to the other but is always displayed on the first screen you see during startup). Go through the entirety of your computer’s BIOS settings, looking for the AMD Cool’n’Quiet feature and the Fast Boot option. If you find any one of these two options, disable If you find both of these two options, disable them both. Once done, be sure to save your changes, and then exit your computer’s BIOS settings. Allow your computer to boot up normally, and check to see whether or not the issue has been resolved once it boots up. Many Windows 10 users who have Windows 10 running out of SSDs (which, all things considered, is definitely a good idea) fall victim to this problem once they install the Creators Update because the firmware for their SSDs is outdated. Yes – whether or not the firmware for your SSD is up to date can be the difference between you having no problem with the Windows 10 Creators Update and you having a pretty big problem with it. To make sure that the firmware for your SSD is up to date, simply go to the Downloads section of the official website of your SSD’s manufacturer and check to see whether or not the firmware you have for your SSD is the latest one. If a newer version of your SSD’s firmware is available, you should immediately download and install it. Once your SSD’s firmware has been updated, restart your computer and check to see whether or not this solution gets the job done once it boots up. Until such time when Microsoft releases a stable version, patch or an update to address these issues. By going back to the previous build or doing a system restore, you’re going to defer the update. Taking Windows 10 back to the point before the Anniversary Update was installed will get you rid of the update. Chances are that in a few days, Microsoft will release patches and further updates to counter this issue so if you do a system restore or go back to the previous build, you can wait for a few days until further news from Microsoft and hopefully by then an update or a patch should be available to address the issue and keep the AU. To do this, at the login screen HOLD the SHIFT key and click the Power (icon) located on the lower right corner. Whilst still Holding the SHIFT key choose Restart. Once the System boots into the Advanced Mode, choose Troubleshoot and then choose Advanced Options. From Advanced Options, choose the option titled Go back to previous build. After a few seconds, you will be asked to choose your User Account. Click on the User Account, key in your password and choose Continue. Once done, choose the option Go Back to Previous Build again. A major problem faced by many users after the Fall Creators Update was their computer crashing every once in a while. Many people reported that the computer crashed randomly with no set time. We traced back the problem to fast boot and hibernation. It seems that the new update contains some bad configurations that due to the fast boot, the computer crashes. If you have already gone through all the steps mentioned above, we can try disabling the fast boot option from your BIOS (motherboard). Most of the computer have different BIOS and have different configurations. 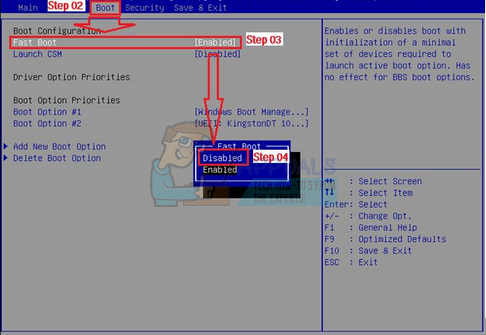 Look around for “boot options” on your BIOS and make sure that fast boot (also known as the quick boot, MSI fast boot etc) is disabled. After disabling the option, restart your computer and check if the problem got solved. Windows 10’s Fast Startup (also called fast boot) works similarly to the hybrid sleep modes of previous versions of windows. It combines the elements of a cold shutdown and the hibernate feature. When you shut down your computer, Windows logs off all users and closes all applications similar to the cold boot. At this point, Window’s state is similar to when it is freshly booted up (as all users are logged off and applications are closed). However, the system session is running and the kernel is already loaded up. This feature makes Windows boot faster so you don’t have to wait the traditional time. However, this feature is also known to cause problems in the recent update by not loading the required drivers properly each time. As it doesn’t reload the drivers, some drivers might not be already be loaded. Due to this, your Windows might be crashing time to time. Press Windows + R to launch the Run application. In the dialogue box type “control panel” and hit Enter. This will launch your computer’s control panel. Once in the control panel, click on Power Options. Once in the Power Options, click on “Choose what the power buttons do” present at the left side of the screen. Now you will see an option which requires administrative privileges named as “Change Settings that are currently unavailable”. Click it. Now head to the bottom of the screen and uncheck the box which says “Turn on fast startup”. Save changes and exit. You might need to restart your computer. Check if the problem at hand got fixed. Note: For some users, disabling and then re-enabling the fast startup option also did the trick. You can try this. If it doesn’t work, disable fast startup completely. Another workaround which worked for most of the users was disabling hibernation from the computer. During hibernation, the computer goes into a semi-sleep state where some of the information is still preloaded into your computer. We can try disabling this feature. If it doesn’t do the trick you can always revert back the changes. Right-click on the power icon present at the bottom right side of the screen and select “Power Options”. Once in the Power Options, select “Change plan settings” in front of the power plan you are currently using on your computer. Now select “Never” in “Put the computer to sleep” in both cases; on battery and plugged. Press “Save Changes” to update the power plan and back to the previous window. 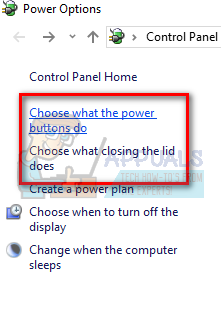 Once in the main window of power options, make the following changes in both options; choose what closing the lid does and choose what the power buttons do. Change all the settings to “Do nothing”. Press Apply to save changes and exit. You can also change the setting of “When I press the power button” to “Shut Down”. Just refrain from using the options of hibernate and sleep in any settings. Restart your computer and check if the problem got solved. Note: If your computer still goes into hibernate mode, you can execute the following command in PowerShell as an administrator.